Kicking Off Oral Health Month! The Affinity Dental team are excited to announce the kick off of Oral Health Month! Oral Health Month is an annual reminder (throughout the month of April) of the relevance and importance great oral heath habits have with respect to you and your family! With gum disease, oral cancer and poor oral hygiene on the rise, your oral health partners at Affinity Dental are here to provide a wide variety of dental services to restore and enhance your oral heath, which in turn will boost your overall heath and vitality. Of all the investments you make, investing in your health is the key to attaining and maintaining the enhanced lifestyle you can enjoy for the rest of your life! Your dental experts at Affinity Dental Clinic are committed to joining with you in achieving your oral and overall heath goals to keep you smiling for years to come. From our preventative oral cancer screenings, to individualized oral hygiene programs ‘ we provide oral health education and solutions which are guaranteed to enrich the lives of our valued Richmond, BC patients. Along with daily brushing and flossing, our dental experts perform routine hygiene treatments with ultrasonic cleaners, which are an essential part of optimum oral health. We recognize the intrinsic link between a healthy smile and a healthy body and we seek to do our part in ensuring our patients success in all areas of life starting with their health thus positively influencing their social, professional, and outdoor recreational lifestyle. We are always interested in hearing about upcoming events in your life and career so we can help out in whatever capacity (for example professional whitening treatment). 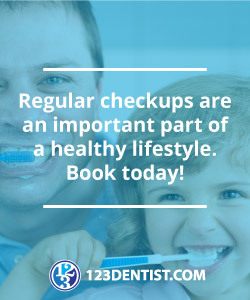 Be sure to schedule appointments for you and your family today, allowing us to do our job in enriching your health, maximizing your smile potential and achieving the lifestyle you deserve.